Colorado Senator Cory Gardner just voted to install one of the single most unqualified, incompetent, and corrupt people ever to be nominated to head the Department of Education. We think he owes Colorado an explanation for the vote — and why he has been dismissive and unresponsive to the concerns of Coloradans about the DeVos nomination and other issues vital to our communities. And what better time to make a commitment to represent the people of Colorado than the day before Valentines? Please join us right before noon Monday in the park next to Senator Gardner’s office. We’ll send a powerful message to the senator by hand-delivering a petition signed by more than 13,000 real Coloradans demanding that Senator Gardner come back to Colorado and hold open, publicly-accessible meetings to hear our concerns. We will meet shortly before noon for a brief rally before a handful of petition signers attempt to deliver the petition to Senator Gardner’s office. If you can, please wear pink or red and bring a handmade sign expressing your concerns. Senator Gardner, Be Ours! 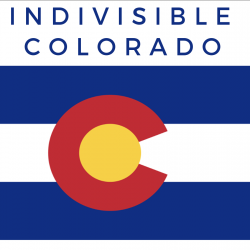 Represent Colorado, Not Big Money. We’re hoping to have members of the press at the rally, so please share this with other friends who are fed-up with Senator Gardner’s unresponsiveness. Despite overwhelming public outcry in Colorado about the DeVos nomination, Gardner instead flew to Florida to raise money for the GOP. Gardner’s office says the number of messages from constituents have skyrocketed in January. The office received 22,000 phone calls and 120,000 correspondences in January, dismissing the broadly as “paid activists” and out-of-state people. We know the truth. Thousands of real Coloradans have been ignored and written off by our elected Senator — and that is unacceptable. The Senator needs to meet constituents face-to-face and show he is listening to them and not just beholden to moneyed interests. You can help fix the Electoral College by taking action prior to the Colorado Senate committee hearing on Wednesday February 15 on the National Popular Vote bill. Express your opinion at the hearing at 1:30 PM in room 357 at the state Capitol in Denver, or from the remote locations connected to hearing in La Junta, Grand Junction, Trinidad, Alamosa, and Durango. Send an email to the five committee members using our convenient email system. Your message will also go to your own state representative and senator and other statewide officials. Phone the five committee members prior to the hearing: Senators Ray Scott (303-866-3077), Vicki Marble (303-866-4876), Jerry Sonnenberg 303-866-6360), Lois Court (303-866-4861), and Steve Fenberg (303-866-4872). The National Popular Vote bill (Senate Bill SB 17-099) would guarantee the Presidency to the candidate who receives the most popular votes in all 50 states and the District of Columbia. It would make every vote for President equal throughout the United States. Five out of our 45 Presidents have come into office without winning the most popular votes nationwide. State winner-take-all laws are the reason why a candidate can win the Presidency without winning the national popular vote. Under these state laws, all of a state’s electoral votes are awarded to the candidate receiving the most popular votes in each separate state. If these state laws are not changed in this current era of close presidential elections (with the average margin in the national popular vote being only 5% since 1988), undemocratic outcomes will happen again. The winner-take-all method of awarding electoral votes was used by only three states in the nation’s first presidential election in 1789 (and repealed by all three by 1800). It was never debated at the Constitutional Convention, and never mentioned in the Federalist Papers. It did not become predominant until 1880 — almost a century after the U.S. Constitution was written. Under the National Popular Vote bill, the national popular vote winner will receive all of the electoral votes of the enacting states. The bill will takes effect when enacted by states possessing a majority of the electoral votes — enough to elect a President (270 of 538). Then, when the Electoral College meets in mid-December, the national popular vote winner will become President because the enacting states will represent at least 270 electoral votes. Thus, the Electoral College will represent the will of the voters in all 50 states (and DC). A national popular vote for President is an achievable political goal that can be in place in time for the 2020 election. The bill has already been enacted into law in 11 states possessing 165 electoral votes. It will take effect when enacted by additional states having 105 electoral votes. The bill has previously passed one chamber in 12 additional states with 96 electoral votes. In Colorado, the bill has previously passed both the House and Senate (but, unfortunately, in different years). The bill was approved earlier this year by unanimous bipartisan committee votes in 2 states with an additional 26 electoral votes. A total of 2,955 state legislators have endorsed it. This event will feature speakers from the community and personal testimonials about the positive impact Planned Parenthood has had on the lives of Coloradoans. We will have a station for making donations to Planned Parenthood and materials for writing letters to Sen. Gardner. Organizers will collect letters to Sen. Gardner at the event to personally deliver to his office when we are scheduled to meet with his staff the following week. We are expecting a huge turnout and we want to reiterate that this type of event does create a lot of noise politically. We will collect hundreds (or thousands!) of letters of support and raise much needed funds at the same time. All of this while coming together as a community and continuing to show that we are in this marathon and we will take these issues on, one by one, together. This is how we create change. As much as we all would love to go to our local Planned Parenthood clinics and fight back against anti-choice protests planned for the day of our rally, those actions will not create change and could in fact be harmful to the very patients, providers, and support staff we seek to support. What we can do is hold our representatives accountable and raise funds to keep the doors open at Planned Parenthood clinics in the Rocky Mountain region. OUR ORGANIZERS WILL NOT HOLD ANY GATHERING OR COUNTER PROTEST AT PPRM.